Jesus spoke of a mysterious "abomination of desolation" as a sign of the end time before His second coming. What does the Bible tell us about this? 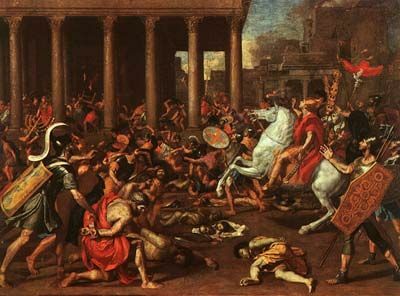 Desecration of the temple by Antiochus Epiphanes. Jesus Christ referred to the “abomination of desolation” in Matthew 24:15, mentioning it as a sign of the end time just before His return to the earth. Jesus’ reference was to a prophecy originally given to Daniel (Daniel 12:11). “The Hebrew root for abomination is shaqats, which means ‘to be filthy,’ ‘to loath,’ ‘to abhor’” (“Abomination of Desolation,” International Standard Bible Encyclopedia). It is most often used to describe idolatrous worship practices, especially those most offensive to a sense of decency and morality. The New Testament equivalent means “detestable.” Albert Barnes adds that the phrase the abomination of desolation “is a Hebrew expression, meaning an abominable or hateful destroyer” (notes on Matthew 24:15). Biblical prophecy often includes more than one fulfillment of a particular statement, and this is certainly the case with Daniel’s prophecy. By looking at previous fulfillments, we can learn more about what to expect in the future. Daniel prophesied that a successor to one of Alexander the Great’s generals would set up an “abomination of desolation” (Daniel 11:31). The Greek ruler Antiochus Epiphanes was the “king of the North” who fulfilled this. He outlawed all forms of Jewish worship; and other practices, including circumcision, were forbidden on pain of death. Sacrifices were to be offered instead to various pagan deities. Then in 167 B.C. an altar to the Greek god Zeus was set up at God’s temple in Jerusalem. Swine, biblically unclean animals, were offered on this new altar, further desecrating the holy place. This was loathsome, abhorrent and detestable to the Jewish people and was the first fulfillment of the abomination of desolation. A second fulfillment occurred in A.D. 70 when Roman armies destroyed the city of Jerusalem; and once again, the temple and altar were desecrated. This time, the temple building and altar were destroyed, not to be rebuilt from that time to the present. Luke 21:20 identifies the armies as the cause of the desolation of Jerusalem in A.D. 70. This event also appears to be the forerunner of a similar event that will happen shortly before the return of Christ (see verses 20-24). In reference to “the end” of this age when He would return to earth a second time (Matthew 24:13-14), Jesus said, “‘Therefore when you see the “abomination of desolation,” spoken of by Daniel the prophet, standing in the holy place’ (whoever reads, let him understand), ‘then let those who are in Judea flee to the mountains’” (verses 15-16). Daniel, the prophet to whom Jesus referred, was told in a vision that the words he had been given were “sealed till the time of the end” (Daniel 12:9) and that “from the time that the daily sacrifice is taken away, and the abomination of desolation is set up, there shall be one thousand two hundred and ninety days” (verse 11). The countdown of days is presumed to be until Christ returns. So here we see another fulfillment of the “abomination of desolation” yet to occur. We should also note that the preceding verse, which mentions this abomination of desolation being set up, also states that the daily sacrifices must be taken away. Since the Jews are not currently offering any daily sacrifices, this means they must be reestablished. For sacrifices to be offered, an altar must be constructed. What this end-time fulfillment of this “abomination that makes desolate” will be has not yet been revealed. But the wise will understand when it is established (Daniel 12:10). We are not told how long these offerings must continue, but at some point they will be stopped. And, based on the historical pattern we’ve seen, something abominable will take place at that site. All this will take place very shortly before the return of Jesus Christ to this earth to set up the Kingdom of God.